The ES Series Master Development System contains everything required to evaluate the ES Series transmitter and receiver and begin to integrate them into a product. The development system features two fully assembled boards for benchmarking and prototyping. One is populated with the ES Series transmitter and the other is populated with the ES Series receiver. On-board remote control encoders and decoders provide a remote control link that activate a buzzer and relay to aid in range testing in the product’s actual use environment. The boards also feature an RS-232 or USB interface for connection to a PC. Included software can be used to transfer data and qualify the link. A large prototyping area with breakout headers and a regulated power supply allows the placement of custom circuitry on the board. This allows the development board to serve as the first product prototype or proof-of-concept. 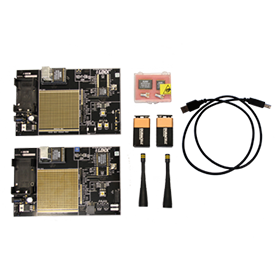 The boards also serve as an example of integrating the modules and provide a benchmark against which to compare the performance of a prototype. The latest software included in the ES/HP3 master development systems. Demonstrates the RS-232 portion of the evaluation kit.